Nikkou-kai was organized in 1986 as a group of craft artists for nationwide activities, with the late Tadashi Saji (lacquer artist, recipient of the Order of Culture in 1995) serving as Chairperson. And its eastern Japan division is designated as "Kouwa-kai." Japanese crafts have been uniquely developed as world-class craft arts with an excellent emotional sensitivity that is peculiar to the Japanese. For our emotional support amid this rapidly-changing modern society, there is a growing demand of prosperous development of craft beauty that is rooted in human's natural act of "creation." 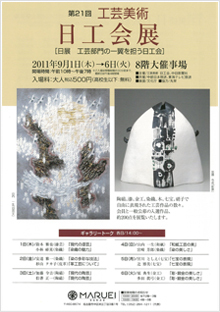 Under this situation, Kouwa-kai intends to contribute to development of Japanese craft arts and advancement of our culture through unique creation activities, respecting freedom of each craft artist to create higher-quality craft arts.